Banneker attended a few years of school as a very young child but was entirely self-educated after the 2nd grade. He lived most of the first 60 years his life within a few miles of his property where he spent his time farming, studying, reading, and exchanging correspondence with other scholars. He enjoyed math, science, and music among other things. He played the violin and flute and became accomplished at both. He was known to keep a large table in the middle of his home that was usually full of various papers and instruments he used for his many hobbies. After the completion of his clock Banneker had numerous visitors who traveled great distances to see his work and learn from him. From what we know he enjoyed many long conversations with other scholars about various things he had interest in. Banneker also would exchange and complete challenging math problems with other mathematicians via mail. Banneker’s quest for knowledge was a lifelong passion as he continually seemed to push himself to explore and learn more about everything he could regardless of his age or what other people told him he could or couldn’t do. At age 58, Banneker began the study of astronomy and was soon predicting future solar and lunar eclipses. He spent a full year painstakingly charting the stars and planet each night. Banneker became a well respected astronomer and was part of a team appointed by George Washington that helped survey the boundaries creating what would become the new capital city Washington DC in 1791. Further expanding upon his astronomy skills Banneker compiled the ephemeris, or information table, for annual almanacs that were published for the years 1792 through 1797. “Benjamin Banneker’s Almanac” contained many useful facts and information Banneker had learned over the years and was a top seller from Pennsylvania to Virginia and even into Kentucky. It was important because it was one of the first published works (and the first almanac or book of “science”) by an African American author. The “Sable Astronomer” was often pointed to as proof that African Americans were not intellectually inferior to European Americans. Thomas Jefferson himself noted this in a letter he wrote in response to Benjamin Banneker who had written a letter to and criticized Jefferson, a slave owner himself, for his “absurd and false ideas” and urged him to recognize that “one Universal Father…afforded us all the same sensations and endowed us all with the same faculties.”Banneker would publish the letters (both his letter and Jefferson’s response) in his 1793 Almanac becoming a forefather in the fight for equality among men regardless of race. 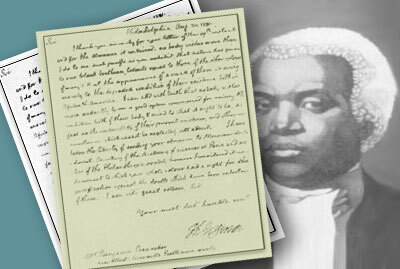 By publishing these letters in his Almanac Benjamin Banneker essentially became the first published Civil Rights Activist and started a movement that continued for over 200 years. Banneker was always driven by the idea that someday America would be free of slavery. Benjamin Banneker died on Sunday, October 9, 1806 at the age of 74. Banneker’s clock, most of his personal belongings and nearly all his writings, research, and books were thought to be destroyed in a mysterious house fire started by arsonists while his funeral was going on a few hundred yards away. By the time mourners realized what was going on fire had engulfed his home and completely destroyed his estate. The loss was tragic and the full extent of what Banneker achieved and was working on at the time of his death will never be realized. Many people have not yet heard the story of Benjamin Banneker and have no idea what he contributed to the great history of this country. It is our mission to not only educate people, but to use the story of Banneker to inspire a sense of pride and to help them achieve greatness themselves. 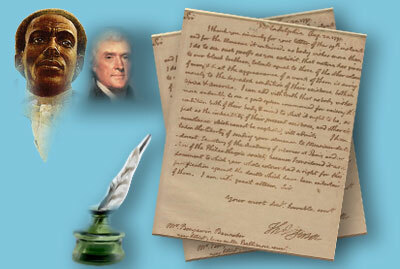 We hope you will join the Banneker Movement and help us share the history as well. Banneker’s life and achievements are inspirational. Despite the popular prejudices of his times, the man was quite unwilling to let his race or his age hinder in any way his thirst for intellectual development. Benjamin Banneker is truly a forgotten founding father. Because Banneker’s clock was made entirely out of wood, all Banneker Watches, Clocks, and Jewelry contain wood elements crafted with a wide assortment of luxury woods from around the world. 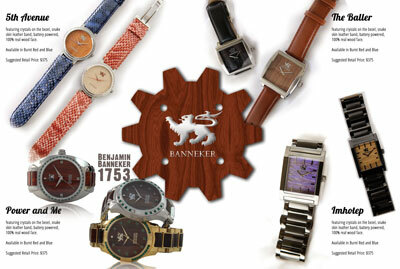 We hope you enjoy your Banneker timepiece and will be as inspired by the story of Benjamin Banneker as we are.